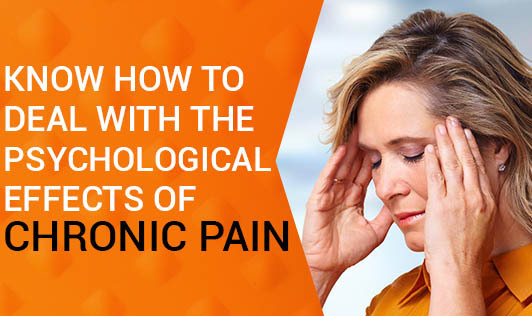 Chronic pain refers to an unbearable condition that millions of people live with everyday. Pain does not just affect the body; it also affects how people feel emotionally. Chronic pain often disables one from doing things he or she used to do, leading to feelings of frustration. It's quite normal to have feelings of anger, frustration and sadness following the diagnosis. The emotional effects of chronic pain include depression, fear or re-injury and anxiety. Try to make behavioural changes: It's important to examine how you're currently feeling to better manage pain. For instance, if you feel frustrated or irritated, then it is essential to recognize the feelings and then examine the behaviours that go along with having that irritable feeling. It's quite helpful to examine behaviours in order to assess the need to initiate a change in attitude or behaviour. Natural ways to cope with pain: Try to manage pain associated anxiety. This is an ideal way for keeping pain under control and to enhance immune system functioning. One can enjoy a better quality of life by using alternative treatments such as Cognitive Behavioural Therapy, eating healthy and following a regular exercise regimen. Exercise: This is one of the best ways to reduce pain. Exercise produces endorphins, which are mood elevating hormones that are useful in fighting pain. In order to relieve pain, endorphins work in combination with analgesic type receptions in the nerve endings, brain and spinal cord. People suffering from chronic pain can reap the benefits that are provided by endorphins by exercising daily. Focus on positive thinking: Try to realise that you are not feeling too well and then attempt to discover new ways to comfort yourself. View yourself from a healthy and positive perspective by acknowledging all of your sound working physical parts such as "My right arm feels great". This technique can change your overall outlook on life, instead of focusing on the negative you are now focusing on the positive. Keep in mind that management of chronic pain requires an individual to consider all aspects of his physical and emotional health. When chronic pain is managed successfully, the person can return to a more productive and rewarding lifestyle!